Doddie Wilson is a Board-Certified Adult Nurse Practitioner. 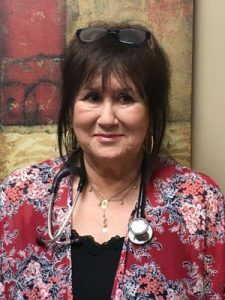 She has been in practice for over 23 years, of which 18 of those years have been with the clinical practice of Dr. Cynthia Thaik and The Holistic Healing Heart Center. Doddie works in the fields of Internal Medicine, Cardiology, Women’s Health and Hormone Replacement Therapy, with both females and males. Her past employment also included working in a Dermatology practice, where she provided cosmetic injectables, facial dermabrasion, and the use of lasers for hair removal, acne and skin refinement. Doddie is also knowledgeable in the use Pelleve, SculpSure and the newest lasers that are available in our clinic. She is the Clinical Supervisor for Burbank Aesthetics Medical Spa.